A full-scale replica of Charles Darwin’s cabin on HMS Beagle is one of the highlights of a new exhibition at Down House (shown above), the naturalist's family home in Kent, that celebrates his 200th birthday and the 150th anniversary of the publication of On the Origin of Species. "Uncovering Origins" charts the progression of Darwin's ideas and the controversy they provoked. Multimedia tours include the Darwins' living quarters and the extensive gardens that served as Charles's outdoor laboratory. Can't get to Kent? The next best thing is a virtual tour of Down House created by English Heritage, which manages the property. 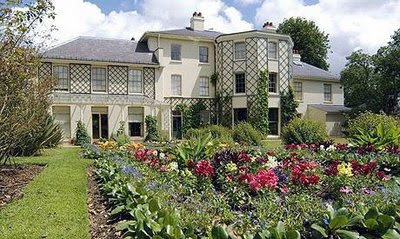 You can explore Darwin's study, listen to Sir David Attenborough describe what the house meant to Darwin and his family, and page through interactive versions of his field notebooks and Beagle diary. 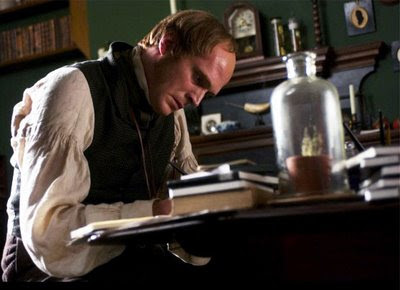 The second new film is Mrs. Darwin, with Joseph Fiennes and Rosamund Pike, who says, "I'm definitely a Darwinist, but playing his wife has been a real eye-opener. She was very religious and his discoveries placed a heavy strain on their marriage. We are exploring different angles to his life story." The HMS Beagle Project will launch a sailing replica of the ship, crewed by scientists and sailors, that will retrace the 1831-36 voyage of the original Beagle. As always, excellent content. Thanks so much for the virtual tour of the house. I could go on at quite some length about my own views on Darwin. I've actually written a currently unpublished article on evolutionary psychology. Darwin's influence has only just begun, and it may go in directions few are expecting. And I just love your previews of upcoming movies. Thanks for keeping your finger on the pulse for us!